Headed out of Denmark, Linak is using Inventory II on Dynamics AX 3.0 with more 350 AX user in 20+ countries. Headed out of Sweden, Lindab is using Inventory II on Dynamics AX 4.0 with over 800 AX users in 20+ countries. Headed out of US, DENTSPLY is implementing Inventory II on Dynamics AX 2009 with more 500 AX user in 20+ countries. Fleggaard is using inventory II on AX 4.0 with more than 100 AX users in Germany. Smith & Nephew is using Inventory II on Dynamics AX 2009 with WMD module in China, Middle East and India. Headed out of Sioux City, Iowa, Wilson Trailor is using Inventory II on Dynamics AX 3.0 with over 300 AX. 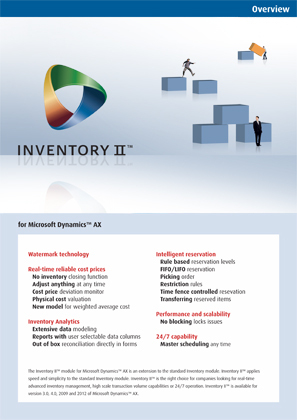 Irma is going to implement Inventory II on Dynamics AX 2012 in Denmark. Mydin is using Inventory II on Dynamics AX 2009 with over 800 AX users in Malaysia. Vingcard Elsafe is using Inventory II on Dynamics AX 2009 with over 200 AX users in Norway. Valora Trade is using Inventory II on Dynamics AX 2009 with over 200 AX users in the Nordic region and in Germany. KNI is using Inventory II on Dynamics AX 4.0 with over 400 AX users in Greenland. Kruuse is using Inventory II on Dynamics AX 4.0 with over 150 AX users in Denmark. Despec is using Inventory II on Dynamics AX 4.0 with over 80 AX users in the Nordic and Baltic region. GPV is using Inventory II on Dynamics AX 2009 with over 200 AX users in Denamrk and Thailand. Rosti is using Inventory II on Dynamics AX 2009 with over 200 AX users in Denmark and China. Saudi Readymix is using Inventory II on Dynamics AX 2009 with over 300 AX users in Saudi Arabia. Kohberg is using Inventory II on Dynamics AX 3.0 with over 40 AX users in Denmark. TeamSportia is using Inventory II on Dynamics AX 2009 with AX Retail over 300 AX users in Sweden. Backer is using Inventory II on Dynamics AX 3.0 with over 300 AX users in Sweden and Poland. Lexibook is using Inventory II on Dynamics AX 2009 with over 100 AX users in France and Hong-Kong. Windhorse is using Inventory II on Dynamics AX 2009 with over 40 AX users in UK. CMR is using Inventory II on Dynamics AX 2009 with over 100 AX users in UK and France. Ceragon is using Inventory II on Dynamics AX 4.0 with over 100 AX users in Norway. Groupe Liebot is using Inventory II on Dynamics AX 2009 with over 200 AX users in France. TopDrinks is using Inventory II on Dynamics AX 2009 with over 50 AX users in Bulgaria. Otra is using Inventory II on Dynamics AX 2009 with over 100 AX users in Norway. Triax is using Inventory II on Dynamics AX 3.0 with over 200 AX users in Denmark. Wunderwear is using Inventory II on Dynamics AX 4.0 with over 40 AX users in Denmark. Hitachi Power Tools is using Inventory II on Dynamics AX 2009 with over 80 AX users in Norway. LKF is using Inventory II on Dynamics AX 3.0 with over 50 AX users in Denmark. Murray Metals is using Inventory II on Dynamics AX 2009 with over 250 AX users in UK. Stibo is using Inventory II on Dynamics AX 4.0 with over 60 AX users in Denmark. Autonet is using Inventory II on Dynamics AX 2009 with over 300 AX users in Romania and Hungary. Depo is using Inventory II on Dynamics AX 2009 with over 300 AX users in Latvia. Thor Industries is using Inventory II on Dynamics AX 2009 with over 300 AX users in US. Menu is using Inventory II on Dynamics AX 4.0 with over 40 AX users in Denmark. Brd. Klee is using Inventory II on Dynamics AX 4.0 with over 60 AX users in Denmark. Indeks Retail is using Inventory II on Dynamics AX 2009 with over 200 AX users in Denmark. Vibocold is using Inventory II on Dynamics AX 2009 with over 40 AX users in Denmark. Savic is using Inventory II on Dynamics AX 2009 with over 40 AX users in Belgium. Linaset is using Inventory II on Dynamics AX 4.0 with over 80 AX users in Czeck republic. Nissens is using Inventory II on Dynamics AX 2009 with over 80 AX users in China. Kolok is using Inventory II on Dynamics AX 2009 with over 80 AX users in South Africa. Asec Cement is using Inventory II on Dynamics AX 2009 with over 100 AX users in Egypt. Elfac is using Inventory II on Dynamics AX 4.0 with over 80 AX users in Nordic region. ISAPA is using Inventory II on Dynamics AX 2009 with WMD module in Brasil. Efekto is using Inventory II on Dynamics AX 4.0 with over 40 AX users in South Africa. Jeff de Burges is using Inventory II on Dynamics AX 2009 with the WMD module in France. BoConcept is using Inventory II on Dynamics AX 3.0 with over 200 AX users in Denmark. Finntack is using Inventory II on Dynamics AX 2009 with over 80 AX users in the Nordic region. Fortune Fashion Industries is using Inventory II on Dynamics AX 3.0 with over 200 AX users in US. H Jessen Jurgensen is implementing Inventory II on Dynamics AX 2012 in Denmark.